Revising a book — or any piece of writing — can be messy work. The word REVISION breaks down into re-vision…or seeing again. And in order to see something again, in a new way, we have to look away from it for a little while first. Sometimes, the very best ideas for revising a piece of writing happen not when we’re staring at that piece of writing but when we’ve set it aside to write on a different sheet of paper or type in a new document. Here are 65 off-draft writing prompts that can help writers of all ages get thinking in new directions. 2. Write a letter to your main character from another character who loves him or her. 3. Write a letter to your main character from someone who doesn’t like him or her. 4. Write a poem in your main character’s voice, using a metaphor to describe a secondary character who matters to him or her. 8. Complete this sentence in your main character’s voice. Everybody thinks my dream is _____________________, but really, it’s _____________________. 13. If your main character could get a do-over on one day of his or her life, which day would he or she choose, and why? 15. If your antagonist were on trial, what would be his/her defense? 16. Describe a place where your main character feels safe. 17. Write a letter from your main character at the end of the book to your main character at the beginning of the book. What advice, warnings, and words of wisdom would he or she give? 18. Writing as your main character, describe the setting of each scene, spending a few minutes on each sense exclusively – sight, smell, hearing, taste, touch. 19. Do the same thing – but as your antagonist. How might he or she perceive things differently? 20. Writing as your main character, look out your bedroom window and describe in detail what you see. 21. How does your main character feel when the phone rings? 22. What are some distinct body language cues, verbal habits, and quirks that your main character displays when he or she is angry? Excited? Embarrassed? Nervous? Scared? Happy? Disappointed? 23. Create a music playlist for your main character. 24. Now create one for your antagonist. 25. If the two had one common song on those playlists, what would it be and why? 26. If your main character eavesdropped on his/her parents having a conversation, what would he or she hear? 27. What’s in your main character’s refrigerator? 28. What’s in the antagonist’s refrigerator? 29. Move your main character from where he or she lives to another state or country…a different landscape. How would life be different? 30. What would the most minor character in your book have to say about the conflict? 32. In your main character’s voice, write a poem about a place he or she loves. 33. What’s your main character’s favorite smell, and why? 34. Write about the rules of the society your main character lives in – the spoken, written-down rules and the unspoken ones, too. What are the consequences when these rules are broken? 35. Describe a sunrise/sunset in your main character’s setting. 36. What would it look like, sound like, and feel like in your main character’s house/school/other favorite place in the middle of a huge storm? 37. Imagine the most uncomfortable situation your main character could possibly be in. Put him or her there, and write everything going through his or her head. What does the character say? What does he or she think but not speak aloud? 38. What happens when your antagonist sees a spider? 40. Make a list of everything in your main character’s closet. What should have been thrown out but wasn’t? What’s right in front? 41. What’s in the newspaper in your main character’s home town. Front page news? Classified ads? Sports section? Weather forecast? 42. If your book’s characters could all vote in the upcoming presidential election, for whom would they vote, and why? 43. If all the characters in your book were in a running race, what would happen? Who would come in first? Last? How would they act at the end? 44. What’s on your antagonist’s bookshelf? 45. What plants/animals live in your main character’s part of the world? Choose three & describe them in detail. 46. Rewrite a scene from your antagonist’s point of view. 48. What historical events happened in the community where your main character lived, and how have those events shaped the character of the community? 49. What was the worst day in your main character’s life? The best? 50. What was the worst day of your antagonist’s life? The best? 51. What kinds of pictures are in a character’s family album? Family shots? Landscapes? Who took most of the photos, and who is featured? 53. What’s your character’s favorite font and why? 54. Write a journal entry from a character, describing your earliest life memory. 55. If you chose a famous quote to represent your book, what would it be? 56. If you could choose one song to go along with your book, what would it be, and why? 57. If this book were made into a movie, who might play the main parts? What body language, characteristics, and quirks do they have that might help round out your characters? 58. If your manuscript could talk to you, what would it say? 59. What’s the most boring part of your manuscript? 60. What’s the best thing about your manuscript? How could you add more of the best stuff? 61. Why is your title your title? 62. You’re a book reviewer who LOVES this book but isn’t allowed to turn in a review without three critical comments. What criticism will you offer? 63. What part of this book would a reluctant reader be tempted to skip or skim? 64. Fill in the blanks in this sentence. My book is kind of like ________ (title of another book) because __________ but it’s different in that ________________________. 65. Stephen King said that “Fiction is the truth inside the lie.” What is the truth your book is telling, whether it’s fiction or nonfiction? What happens when there are so many revisions that it is difficult to keep track of all of the revisions? Just kidding! 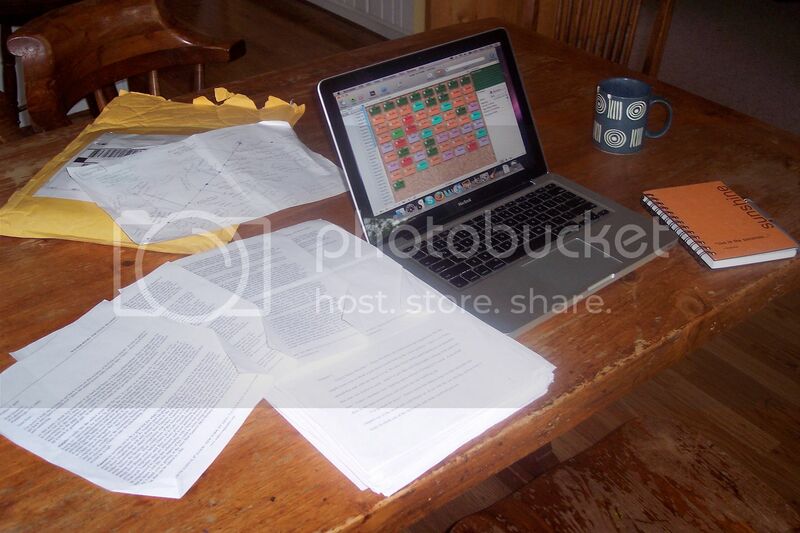 :) I find that the revision process reminds me of my desk at school. The desk looks like complete chaos, and at times feels like complete chaos when I am in a hurry, but I always (eventually) find what I am looking for. I love #27, #41, and #65. I have used #39 in language arts and social studies class (with important people in history). Back to revising! Thank you for the tips! Another great post. Thank you for this extensive list that I will share with my teacher colleagues (via a link to your blog, of course)! I love this list and can actually see using many as quick writes with my third graders. I have been having so much fun reading the blog this summer (and all of the ideas and stories from so many talents). Thanks for all you do! *bowing* “We’re not worthy, we’re not worthy…”. :-). A million thanks for the thought provoking post on revision! I have to order your book as B & N does not have it on the shelf – their mistake. My TBR list is increasing exponentially; wonder if the BOE in my district could delay the start of school and let me catch up….off to write and read..